KLUEEE Admit Card 2019: Koneru Lakshmaiah University (KLU) conducts an entrance exam at the university-level to provide admission in the field of engineering & technology. Applicants who have registered themselves successfully, can download their admit card with the help of application no from the official site. It is mandatory to download the admit card before the exam to participate successfully. Exam invigilator’s will verify the admit card and then give permission to students to enter in exam room. 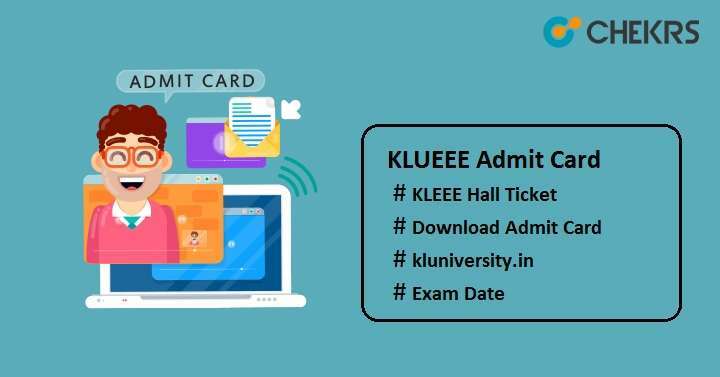 Go through this article to know all the information related to KLUEEE 2019 Admit Card. Candidates who have been applied for the application form and submitted it on or before the last date successfully, they will be able to download the KLUEEE Admit Card 2019 from the official site. It will be available from April onwards. The admit card release date will be same for both AP Online & AP Offline Test. Check the tentative dates to get the idea about the KLU Hall Ticket Release Date and important date also related to KLUEEE so that you can appear on time for exam and other admission process. Go to “Admissions” option on the top of home page. Click on the “KLEEE 2019 Hall Ticket”. Enter the application no and click on the “Submit” button. The admit card will be displayed on your device screen, download it and take the print-out also. If you forget the application no then click on “Click Here to find your Application Number” and enter your name then you will get the application no. Do not tamper and damage the admit card till the admission process as you will not get any duplicate admit card. Candidates are suggested to carefully verify the details mentioned over admit card after downloading it. In case any discrepancies, must contact to the KL University officials immediately. In case, candidates are unable to download the admit card, then contact to university officials immediately before the exam. Take 2 or more prints of admit card and keep it safe until the admission procedure is finished. Do not forget to bring the hall ticket during the exam, as you will not be allowed to enter in the exam hall without it. The admit card will not send by post to any candidates, so must download it from the university portal before the exam. Do not write anything on the admit card and read the other important instructions printed on it. Candidates are advised to enter the exam hall 30 minutes before the commencement of exam. Here we have provided all the detail information related to KL University Entrance Exam Admit Card, we hope that candidates will be able to download it easily by following the procedure we have mentioned. In case any query, you can ask your question by commenting in the comment box below. We will help you for sure. Keep checking this site to get latest updates. Good Luck!! !